Taken from Robert Ingersoll’s “Discussions”. Full text is available here. 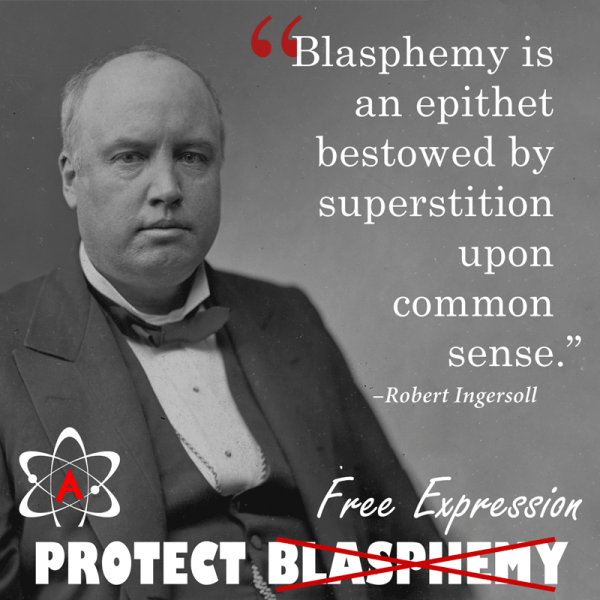 Blasphemy is an epithet bestowed by superstition upon common sense. Whoever investigates a religion as he would any department of science, is called a blasphemer. Whoever contradicts a priest, whoever has the impudence to use his own reason, whoever is brave enough to express his honest thought, is a blasphemer in the eyes of the religionist. When a missionary speaks slightingly of the wooden god of a savage, the savage regards him as a blasphemer. To laugh at the pretensions of Mohammed in Constantinople is blasphemy. To say in St. Petersburg that Mohammed was a prophet of God is also blasphemy. There was a time when to acknowledge the divinity of Christ in Jerusalem was blasphemy. To deny his divinity is now blasphemy in New York. Blasphemy is to a considerable extent a geographical question. It depends not only on what you say, but where you are when you say it. Blasphemy is what the old calls the new–what last year’s leaf says to this year’s bud. The founder of every religion was a blasphemer. The Jews so regarded Christ, and the Athenians had the same opinion of Socrates. Catholics have always looked upon Protestants as blasphemers and Protestants have always held the same generous opinion of Catholics. To deny that Mary is the Mother of God is blasphemy. To say that she is the Mother of God is blasphemy. Some savages think that a dried snake-skin stuffed with leaves is sacred, and he who thinks otherwise is a blasphemer. It was once blasphemy to laugh at Diana of the Ephesians. Many people think that it is blasphemous to tell your real opinion of the Jewish Jehovah. Others imagine that words can be printed upon paper, and the paper bound into a book covered with sheepskin, and that the book is sacred, and that to question its sacredness is blasphemy.